Tired of checking your Gmail ? Have more than one account ? Gmail Notifier is the perfect solution for you - and its free ! Gmail Notifier is a free notification when receiving new messages in your mailbox at the level proposed by the Google mail service Gmail. The program adds its icon in system tray menu, and alert you if you have unread messages, showing their titles, senders, and even parts of their text without having to open a Web browser. Part of the time spent on the Internet is lost, to check whether someone has sent e-mail. If you email in Gmail, by extension, Gmail Notifier will tell if you have new messages. 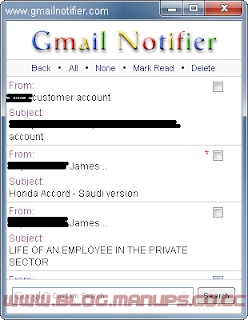 Moreover - if you want, straight extension will open your mail in Gmail without having to enter username and password. This little application will prove especially useful for anyone who owns an email account in Gmail, the e-mail system from Google with a capacity of 1 GB of storage that every day is becoming more popular. 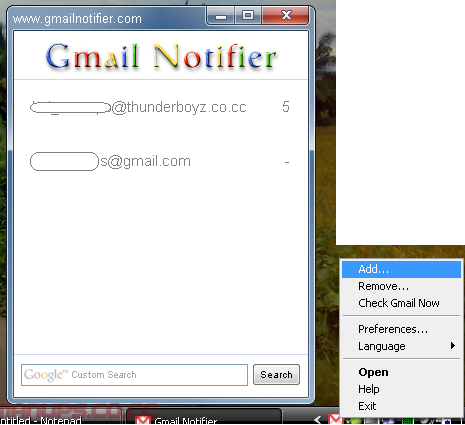 Gmail Notifier 1.0.0.80 is a reporting tool for Gmail accounts officially developed by Google, and with it you will be aware of emails that you receive in Gmail without having to visit your page every now and then. When you have a new message, the program displays a warning in the lower right corner of the screen, with information such as sender, subject and the first lines of the message. Tip: To add multiple gmail account click on the tray icon, and select "Add..."